The organic carbon found in permafrost is being released as the ice melts after ages of confinement in the soil, and making its way into Arctic and subarctic lakes and ponds, modifying their composition. These are the findings of an international team of researchers that includes Professor Isabelle Laurion of INRS showing the influence that thawing permafrost has on surface water biogeochemistry. Published in Limnology and Oceanography Letters, the results demonstrate that organic carbon from permafrost is making its way into the waters of these regions. This type of carbon is particularly good at absorbing sunlight. As a result, these water bodies are becoming increasingly darker and more stratified, which affects a number of biological processes in these ecosystems. Frozen tundra soils are one of the largest pools of organic carbon on the planet. 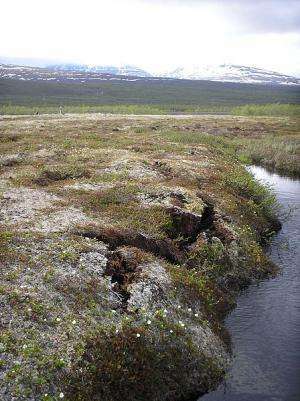 With climate warming, permafrost thawing has accelerated, increasing the risk that a large portion of this carbon will be released into the atmosphere as greenhouse gases. However, little study has been done thus far on the effects of permafrost thaw on Arctic and subarctic ponds. Using chemical, biological, optical and isotopic measurements, researchers from Québec, Denmark, Finland, and Sweden have analyzed hundreds of samples from 14 circumpolar regions spanning from Alaska to Russia (from the subarctic zone to the High Arctic). The samples were taken between 2002 and 2016 from 253 ponds distributed based on their exposure to permafrost thaw. Despite variations in the limnological properties of the Arctic systems studied, the researchers clearly observed that permafrost thaw is resulting in higher concentrations of organic matter from catchment soil. "Land-derived organic carbon is having a growing influence on Arctic and subarctic ponds, which carries over into the food web," the authors write. "The browning of these systems leads to oxygen depletion and cooler water at the bottom of the ponds, which can have a major impact on the microbial activity responsible for the production and consumption of greenhouse gases, particularly the production of methane, a powerful greenhouse gas."